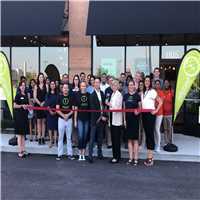 MOUNT PROSPECT, Ill. (OCTOBER 29, 2018) – Aligned Modern Health, which offers patients functional medicine and clinical nutrition, acupuncture, chiropractic physical medicine, physical rehabilitation, and massage therapy, has opened up a 2,500 square foot clinic at 1105 N. Elmhurst Road in Randhurst Village in Mount Prospect. The health care provider, which has 15 clinics in the Chicago area, is focused on helping people live pain free through non-invasive, evidenced-based care. With a patient-centered approach that individualizes all treatment plans, Aligned Modern Health is a top-rated health care provider according to Yelp and has received accolades as the Best Sports Rehabilitation in the Midwest and Best Sports Massage from Competitor Magazine. Since opening in 2010, AMH has opened 15 locations in the Chicago area and employs more than 100 professionals dedicated to improving people’s lives. More information on the company is available at www.alignedmodernhealth.com or email info@alignedmodernhealth.com.